Are you among people who still enjoy ice cream even when it’s cold or raining? I know I am. I can walk along Session Road with a Session Delights ice cream on my hand and not feel any colder. So if you’re one of us, then the event below is perfect for you. It’s raining and it’s cold outside and even inside the mall. Yet an ice cream is still irresistible most especially if it’s free. 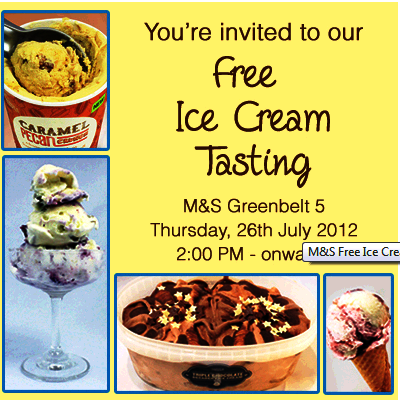 With Marks & Spencer, you can have a lick of your favorite ice cream on July 26, Thursday, that’s tomorrow from 2 PM and onwards at Greenbelt 5. Aside from a free ice cream, you’ll also become a part of a historic event for Marks & Spencer as they launch their own ice cream product. Although I’m a bit wondering why there was a sudden interest for a clothing company in food, particularly ice cream. Anyway, don’t fail to come! The event is brought to you in part of Nuffnang, Asia’s growing advertisement media. I received an invitation via email, being a Nuffnang publisher. But everyone is invited to join. In fact, you can let everyone know by sharing the news and the free ice cream. If you’re coming, make a confirmation by tweeting over Twitter @NuffnangPH using the hashtag #FreeIceCream.